Twitter is one of the largest online service for microblogging (like blogging, but just simple phrases or thoughts). We all saw it grew from a simple past time to an internet phenomenon. We all remembered Ashton Kutcher achieved his 1 millionth follower on Twitter which is a feat indeed. Followed by Oprah Winfrey creating a Twitter account that made Twitter a household name all over the world. Everyone wanted to be famous, everyone wanted to be talked about in the internet. Recently that fame was put into question. 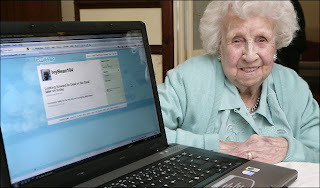 The supposed to be "Oldest person to twit" and the "First twit in space" has been proved to be false, find out how after the jump. However, we’re happy to point out that the story wasn’t just cooked up by the Telegraph to get onto Digg - but lots of journalists and bloggers fell for Geek Squad’s PR. Compounding the issue however is The Next Web which seems to think TechCrunch’s non-scoop was itself an attempt to get on Digg - and predictibly did a post on it in a slightly bizarre tirade. Clearly, The Next Web did not realise it was a Geek Squad press release the first time round and still hasn’t. They sign off their story with “This is clearly not a completely fabricated story.” Instead it attacks TechCrunch for not celebrating the fact a 104 year old is on Twitter, a story which “made people smile”. Come again? Since when were independent bloggers supposed to just celebrate things - instead of getting the facts right? Did a NASA astronaut really "tweet" from space? That's the question bouncing around Twitter about "@Astro_Mike," or Mike Massimino, an astronaut on space shuttle Atlantis, set to land today at Kennedy Space Center. 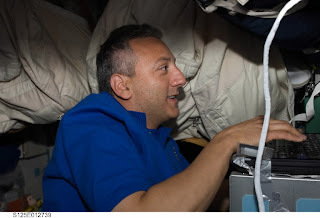 On May 12, Massimino wrote, "From orbit: Launch was awesome!! I am feeling great, working hard, & enjoying the magnificent views, the adventure of a lifetime has begun!" Ever since, NASA, newspapers, TV shows and blogs have been crediting him as the first person to post on the microblogging service, or "tweet," while in orbit. In reality, Massimino writes his updates in space and then e-mails them to Houston, where a NASA employee posts them to his Twitter profile. That often takes hours because e-mails are only transmitted from the shuttle a few times a day. That's not exactly in line with the "What are you doing?" instant ethos of the site. "... [I]f you're in a plane & write a tweet, but don't hit send until u land, did u tweet from a flying plane? no, u tweeted from land," "josh_sternberg" posted recently. James Hartsfield, a NASA spokesman, acknowledges that Massimino's system strips away some of the immediacy people associate with the 3-year-old service, which has exploded to include millions of users in recent months. But he said it's the only way to do it because astronauts cannot directly access the Internet. To preserve the intimacy of Massimino's tweets, Hartsfield said that other than adding "from orbit" before each message, NASA does not edit them. "It's as close as you can possibly get to a post from space," Hartsfield said. "Anything you are going to do from space is going to pass through some type of hands before it gets to its final destination on the Internet. ... Maybe someday in the future, for the space station, they will have [Internet access], and then it can be a little more streamlined." Twitter users can post via e-mail but have to reveal passwords to a third party — something NASA might frown upon. Hartsfield said NASA is open to other methods and pointed out that in June, shuttle Endeavour commander Mark Polansky ("Astro_127" on Twitter) also plans to tweet from space and answer YouTube video questions. Most in the Twittersphere don't seem to mind Massimino's unorthodox way of tweeting. Instead, they marvel at seeing updates on their phones or computers written by someone looking down at them. Massimino has more than 330,000 people following him. "I marvel in jaw-sagging wonder at @Astro_Mike's daily routine, although I bet he'd enjoy a nice sit down and a cup of tea right about now," "mcsubs" tweeted Thursday. And in the tradition of Twitter, others are using the milestone for complaining. "Explain to me why I can not get phone service ... but an astronaut can tweet from space??" asks a tweet from "cwrightmn." How far can you go on deceiving people just to be famous?